Fire safety test shows Grenfell cladding system was "an absolute failure"
Fire safety test shows Grenfell Tower's cladding system was "an absolute failure"
A mockup of the cladding system blamed for the catastrophic scale of the Grenfell Tower blaze has failed its government-ordered fire safety check. The fire safety test was carried out on a large-scale replica of the Grenfell Tower cladding system by Building Research Establishment (BRE) on behalf of the government. Part of the test was broadcast on Newsnight, on the UK's BBC Two television channel, during which policy editor Chris Cook slammed the design as "an absolute failure". The test was carried out on a nine-metre tower of aluminium panels with a combustible polyethylene plastic core and combustible PIR plastic foam insulation. 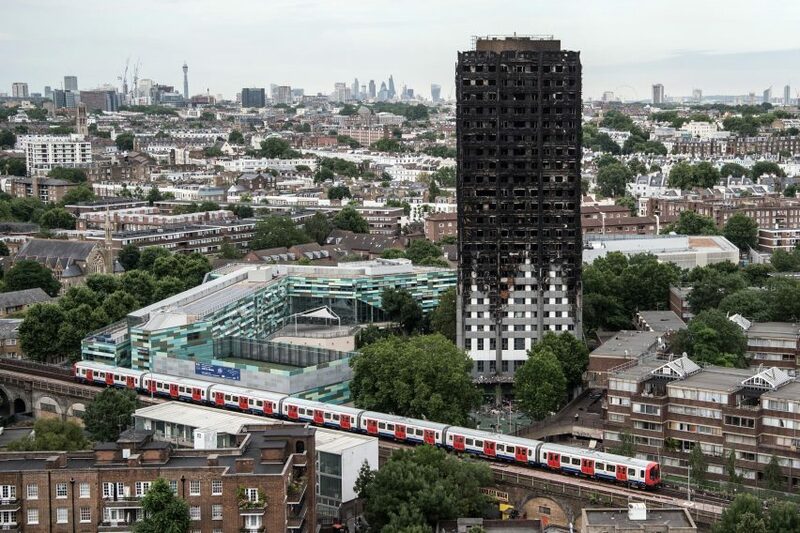 The system matches that used to re-clad the west London tower, ahead of the fatal fire that broke out on 14 June and killed at least 80. Both vertical and horizontal fire brakes were included in the test system, to ensure the system would perform to the best of of abilities – because many people have suggested that errors might simply have been made in the fitting of the panels at Grenfell. In spite of this, the system still failed. "The critical thing about this test is that it is a test on the choice of materials used in Grenfell, installed perfectly. This isn't about 'maybe they messed up the installation', 'maybe they didn't include fire breaks'," said Cook in the broadcast. "They've conducted a test with all of the fire breaks in place, and it burned. The whole test was an absolute failure." Had such a test been carried out prior to installation at Grenfell Tower, the materials would not have been used, according to Cook. "That choice of material would never have been acceptable. It also reveals to us that the building industry has got into the habit of using materials on tall buildings that fundamentally shouldn't be on tall buildings," he said. "If someone had followed the simple letter of the law and had done a proper test more than two years ago, that cladding would never have been put on that building." The government has confirmed the test as proof that this combination of materials does not meet current building regulation guidance BR 135. Currently 82 buildings in the UK are known to have this combination of materials in their cladding systems – with 47 of these owned or managed by local authorities. The test is the first of six that will be carried out at the Watford fire laboratory, which will conduct checks on five further combinations of the materials. "Each test involves building a nine-metre-high demonstration wall with a complete cladding system, including cladding panels, insulation and cavity barriers," said a statement from the government's Department for Communities and Local Government. "This is then subjected to a replica of a severe fire inside a flat as it spreads out of a window, to see whether it meets the requirement to resist vertical fire spread." So far, 60 towers across England using have failed the initial BRE fire checks that were ordered on tall buildings over 18 metres in height in the aftermath of the Grenfell blaze. Photograph of Grenfell Tower is courtesy of Getty.